1. Use the English Language? Earnest Hemmingway’s relative minimalism is not the last word on style. Some writers may preach that less is more, but that’s simply personal preference. Elmore Leonard is not a better writer or stylist than James Lee Burke, nor is Hemingway better than Faulkner. There just different. 2. If you’re writing literary fiction, make something happen. Interior conflict only goes so far in carrying a story forward. On the other hand, genre writers ought to avoid characters that behave like robots. Plot-driven fiction does not preclude interior reflection or character development. 3. Avoid characters who converse in a white space with nothing but their voices on the page. Setting matters. Don’t go overboard, but let your reader see where your characters are interacting. 4. Find first readers who care about your work and understand what you’re trying to accomplish. Fewer readers are better than many. If possible, have people read for different reasons. For instance, I’ve always tried to find readers specifically interested in story, style, grammar or pacing. Workshops can be helpful if you trust the readers, but beware of “art by committee.” The blizzard of comments and suggestions can be confusing and counterproductive, so trust in your own opinion best of all. 5. make writing your life, not just a passing fancy. Don’t imagine that publishing a novel will make you rich and famous. Maybe it will, but probably it won’t. Don’t see writing as a career change. Don’t give yourself six months, a year or two years to make it as a writer. Think instead that once you put words on a page, you are a writer, and this is something that will fascinate, frustrate and fulfill you for the rest of your life. Here I am again, the lady that disappeared for a while. I did find out I couldn’t stay away from my writing even though I didn’t blog as I should have. I have been working on a new book that is for children above 10 and parents to learn about bullying. It’s called Thomas Gomel Learns About Bullying. What I’m doing is writing a fictional story using a 12-year-old boy and his family to teach children how to handle bullies as well as the parent dealing with a child that is being bullied. What do you think of my cover? Does it give a message to you when you see it? Let”s talk about our bullying experiences if you had any. I have actually heard from some who did not have any problems. How wonderful for them. I wasn’t one of those people. I was a new kid in a small school that moved from California to Oklahoma. I didn’t look right, I didn’t talk right. I just wasn’t right for about six years. I had two very dear friends that helped me survive School. I am almost 70 now and that trauma is not forgotten. I forgave and made some friends of those school chums, but the trauma I went through really never left my mind. Here is another teaching by Jim Rohn. I hope you enjoy the read. One of the first things successful people realize is the old adage, “If it is to be, it is up to me.” That is your success and your course is up to you. This doesn’t mean that you do it all alone. It simply means that you take responsibility for your life and your career. Too many people today look at opportunity and figure it is up to someone else to make sure they get it. They look at financial security and hope that the government will make sure they live safely in retirement or in case of disability. They wait and wait, figuring that it is all up to someone else. And then the wait is over, and it is too late to do anything. Their life is over and they are filled with regret. But this isn’t true for you. You know that you must take responsibility for your life. It is up to you. The fact is that nobody else is going to do it for you, you must do it yourself. I have nothing against affirmations as a tool to create action. Repeated to reinforce a disciplined plan, affirmations can help create wonderful results. Now, some people may say, “Jim, that’s a lot of responsibility.” Friends, that is the best news you can ever hear. You get to choose your life. Hundreds of millions of people all around this world would give anything to live in the situation you do—just for the chance to have the opportunity to take control of their destiny. “It is up to you” is a great blessing! 1. You get to chart your own destiny. Maybe you want to start a small business and stay there. That’s great because you can choose that. Maybe you want to have a net worth of $100 million. The idea is that you get to choose. You can do whatever you like. Different people have different dreams and they should live them accordingly. 2. You can reap what you sow. Sleep in and go to work late and reap the return. Or get up early and outwork the others and earn a greater return. You decide what you will sow and thus what you will reap. 3. No one else can stop you from getting your dream. Yes, there will always be things that come up and people who may not like what you are doing, but you can just move on and chart your own course. There is great freedom in that. 4. You experience the joy of self-determination. There is no greater pride than knowing you set your mind on something and accomplished it. Those who live with a victim mentality never get to experience the joy of accomplishment because they are always waiting for someone else to come to the rescue. Those who take responsibility get to live the joy of seeing a job well done. This is another article from Jim Rohn, a life coach and Philosopher, who shares shares nine principles necessary for a successful life and a lasting legacy. “You know me, I am a philosopher. I love principles. Yes, actions are great and I talk about them regularly, but the important stuff is what lies underneath—the principles,” Rohn says. 1. Life is best lived in service to others. This doesn’t mean that we do not strive for the best for ourselves. It does mean that in all things we serve other people, including our family, co-workers and friends. 2. Consider others’ interests as important as your own. Much of the world suffers simply because people consider only their own interests. People are looking out for number one, but the way to leave a legacy is to also look out for others. 3. Love your neighbor even if you don’t like him. It is interesting that Jesus told us to love others. But he never tells us to like them. Liking people has to do with emotions. Loving people has to do with actions. And what you will find is that when you love them and do good by them, you will more often than not begin to like them. 4. Maintain integrity at all costs. There are very few things you take to the grave with you. The number one thing is your reputation and good name. When people remember you, you want them to think, “She was the most honest person I knew. What integrity.” There are always going to be temptations to cut corners and break your integrity. Do not do it. Do what is right all of the time, no matter what the cost. 5. You must risk in order to gain. In just about every area of life you must risk in order to gain the reward. In love, you must risk rejection in order to ask that person out for the first time. In investing you must place your capital at risk in the market in order to receive the prize of a growing bank account. When we risk, we gain. And when we gain, we have more to leave for others. 6. You reap what you sow. In fact, you always reap more than you sow—you plant a seed and reap a bushel. What you give you get. What you put into the ground then grows out of the ground. If you give love you will receive love. If you give time, you will gain time. It is one of the truest laws of the universe. Decide what you want out of life and then begin to sow it. 7. Hard work is never a waste. No one will say, “It is too bad he was such a good, hard worker.” But if you aren’t they will surely say, “It’s too bad he was so lazy—he could have been so much more!” Hard work will leave a grand legacy. Give it your all on your trip around the earth. You will do a lot of good and leave a terrific legacy. 8. Don’t give up when you fail. Imagine what legacies would have never existed if someone had given up. How many thriving businesses would have been shut down if they quit at their first failure? Everyone fails. It is a fact of life. But those who succeed are those who do not give up when they fail. They keep going and build a successful life—and a legacy. 9. Don’t ever stop in your pursuit of a legacy. Many people have accomplished tremendous things later on in life. There is never a time to stop in your pursuit of a legacy. Sometimes older people will say, “I am 65. I’ll never change.” That won’t build a great life! No, there is always time to do more and achieve more, to help more and serve more, to teach more and to learn more. Keep going and growing that legacy! Your legacy is what remains on earth even after you’ve passed away. Learn more on how to understand, choose, focus and live yours. In the process of living, the winds of circumstances blow on us all in an unending flow that touches each of our lives. We have all experienced the blowing winds of disappointment, despair and heartbreak. Why, then, would each of us, in our own individual ship of life, all beginning at the same point, with the same intended destination in mind, arrive at such different places at the end of the journey? Have we not all been blown by the winds of circumstances and buffeted by the turbulent storms of discontent? The same circumstances happen to us all. We have disappointments and challenges. We all have reversals and those moments when, in spite of our best plans and efforts, things just seem to fall apart. Challenging circumstances are not events reserved for the poor, the uneducated or the destitute. The rich and the poor have the same challenges that can lead to financial ruin and personal despair. In the final analysis, it is not what happens that determines the quality of our lives—it is what we choose to do when we have struggled to set the sail and then discover, after all of our efforts, that the wind has changed directions. Learning to reset the sail with the changing winds rather than permitting ourselves to be blown in a direction we did not purposely choose requires the development of a whole new discipline. It involves going to work on establishing a powerful, personal philosophy that will help to influence in a positive way all that we do and that we think and decide. If we can succeed in this worthy endeavor, the result will be a change in the course of our income, lifestyle and relationships. If we can alter the way we perceive, judge and decide upon the main issues of life, then we can dramatically change our lives. Today I’m a nurse and want to do a little teaching. What did you think when you read my title? Did you think about getting so mad you wanted to blow up? Well today we are going to chat about when you actually blow your top because you have ignored your blood pressure. We all have a blood pressure. If we didn’t we wouldn’t be walking around. If any of you have ever had low blood pressure you know it sometimes makes you feel as if your legs weigh 500 pounds apiece and you can barely drag along. When your blood pressure is high in the first stages, it also makes you barely drag around. Your head can feel light as if it’s not on your body, or you could have a non-ending headache. Sometimes they are really bad but most of the time they’re aggravation to you. I venture to guess that a majority of time these little things are ignored until bigger problems begin. This seems to happen more with men than woman since they don’t like going to the doctor’s office. I know a young man now that is in his mid 20′s, smokes, and his blood pressure is consistently above 140 systolic (top number) and 100 for the diastolic (low number). He has been told many times what is happening to his body but he chooses to ignore it since he doesn’t feel any different. The sad thing is I know this handsome young man is a walking time bomb. For you who may not know about what the blood pressure actually is, I will explain it the best I can. The top number of the blood pressure is the Systolic pressure. What it represents is the amount of pressure that is put against the vessels when the heart pumps it out. The Diastolic pressure is the amount of pressure that remains in the vessels when the heart is resting between beats. Because his pressures are high all the time his vessels throughout his body, but especially in the brain, are under constant pressure which stretches and thins them. At some point in the future without the hand of God touching him he will rupture a vessel. All it will take is a pressure higher than normal and he will literally blow his top. It can happen anywhere in the brain. I’m sure all of you have seen people who have had strokes. There are those that are so severe that they can no longer walk or speak and most of the time end up with a g-tube into the stomach for feeding. There are others who are paralyzed on one side or blind. All depending where the vessel ruptured. It’s not a pretty picture, but it happens to far to many of us, both male and female. I know everyone has heard that salt is one of the biggest contributors to hypertension, and so is smoking. Having constant stress in your life is another big factor. Then there are those that it doesn’t matter what they do and how good their lifestyle is their blood pressure is out of site. Even children are having problems with their blood pressure and that has to do with the food we are feeding them. I for one do not want to be one of those people who have a stroke. I have all the risk factors, I’m overweight, I eat too much processed food, and the list could go on forever. Do yourself a favor and go to webmd.com or any other medical program on the web and read about the symptoms of hypertension and how you can control it. Have your blood pressure checked often and if it is above 140 for the top number and higher than 85 for the bottom number, talk to your doctor. It could save you and your family a lot of sorrow. Have you ever given any thought to how amazing the mind is. The more I read and watch what happens in this world, the more I realize what an amazing creation God gave to us. Even as slow as I can be at times, it’s the other times that totally blows me away. I ask myself “how is this possible, because I know me very well and this is not my norm.” I’m not the brightest bulb in this vast closet we all live in, but I’m not the dimmest either. Why my brain can do what it does I will never figure out. Some people may think they know, but there is always an area of doubt when it comes to our minds. Science is making headway into figuring it out, but still has a long way to go. The only symptom I don’t have is the recurring thoughts of suicide. I think of death, but not suicide. I deal with it every day. Please don’t think I’m whining because I’m not. It”s just a part of being me. Encephalitis (en-sef-uh-LI-tis) is inflammation of the brain. Viral infections are the most common cause of the condition. Encephalitis can cause flu-like symptoms, such as a fever or severe headache, as well as confused thinking, seizures, or problems with senses or movement. Many cases of encephalitis may go unnoticed because they result in only mild flu-like symptoms or even no symptoms. Severe cases of encephalitis, while relatively rare, can be life-threatening. Because the course of any single case of encephalitis is relatively unpredictable, it’s important to get a timely diagnosis and treatment. Of course, I had to be one of the rare exceptions. I acquired equine encephalitis from mosquitoes at the same time my Uncle had two horses die from the disease and also a boy in Atoka, Oklahoma did. He died, but God decided it wasn’t my time to join him yet and kept me in this world. I think I was around 12 or 13 when it happened. I’m still dealing with the side effects from the disease. That’s another one of the “it’s just me” area’s of my life. 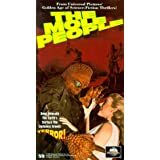 This reflection of my life is all due to finding a movie on YouTube this morning called “The Mole People.” I saw that movie in 1956 in Marysville California at a movie theater with my cousins. I was six years old. That is the first time I can remember being in a movie theater. I never forgot that movie. I told many people about the scenes from that movie over the years. I ‘m almost 65 years old and I can barely remember my name at times, but I never forgot an old campy horror film. That takes me full circle back to how amazing the brain is. Of all of the life events I could remember, why is it “The Mole People?” I guess only God knows that answer and I’ll have to wait to get my answer. Mind boggling, isn’t it? Here is that wonderful old horror film. See if you can forget it easier than I could.